This very common scenario arises when two zero-pressure accumulating conveyors are connected by a non-accumulating curve. 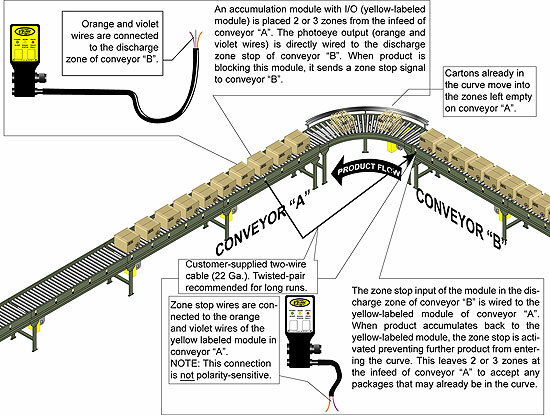 Normal EZLogic™ extension cables may be used to provide communication between conveyors. However, this provides no place for packages that may have already entered the curve to accumulate, as illustrated in the diagram. 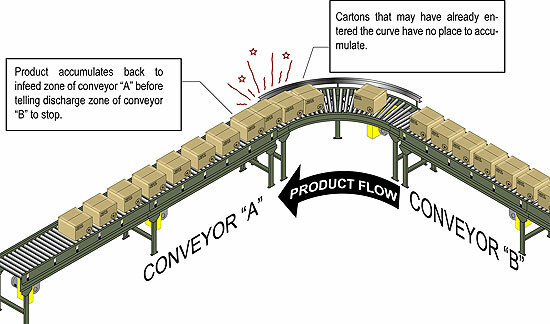 Since the curve continues to drive these cartons into the infeed end of conveyor “A”, undesirable “bunching,” possible jams, and product damage may occur.